Is this possible? LogEntries doesn't seem to be able to offer better result either. Apparently window.onerror doesn't return that information, unless CORS is set up properly, which wasn't the case in my setup, judging by the fact that a naive onerror handler gets "Script error" and 0. Trigger the error. Note that full information is available. Remove rollbar code from the page and reload. Re-add the simple onerror handler. Trigger the error. Notice how the error handler only gets Script and 0. 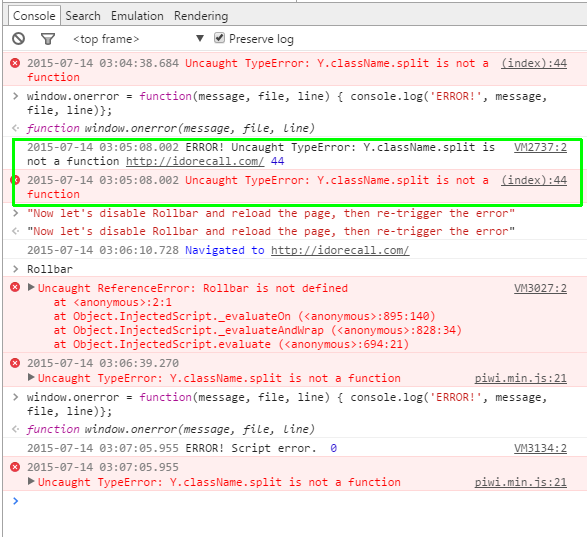 Therefore, Rollbar managed to catch the error from the 3rd party script. Interesting, any idea how Rollbar does this? Seems like a useful addition. @dandv try to test this one after hosting your webpage on a server. It gives the script error when you runs the webpage from filesystem as browser does not allow your script to read the actual error message. @dandv you can add a crossorigin attribute in src tag. You'll be to be able to gets the exception.